Merry Christmas-robin,wally,and superboy. 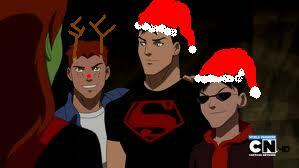 YJ boys in santa hats, and wally as a red nose reindeer. Wallpaper and background images in the Justicia Joven club tagged: young justice robin wally superboy. This Justicia Joven fan art might contain máscara de esquí, animado, cómic, manga, historieta, anime, and dibujos animados. join in any batman games. won't you guide my batmobile tonight?" "Wally with your nose so bright won't you guide my batmobile tonight"